Recently the perfect opportunity arose to get to know the lovely new addition to my spindle collection, the lovely Bog Oak Turkish from IST Crafts. 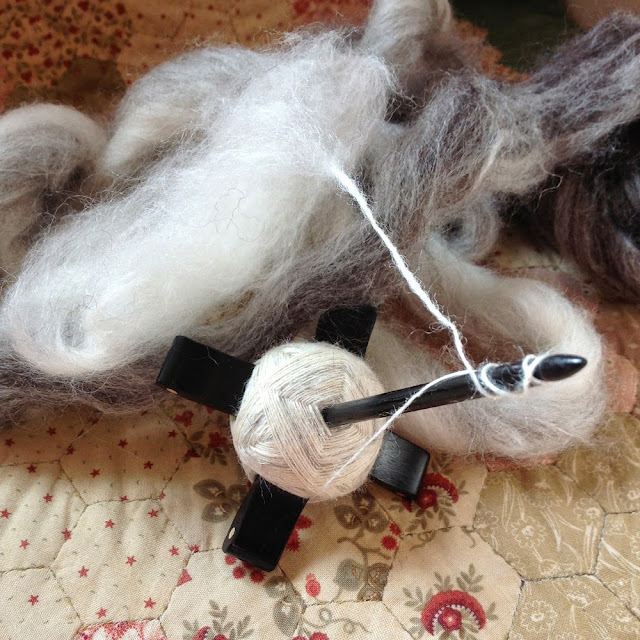 Malia of The Yarnraising Podcast is hosting a New to You Spin-Along so I thought I would gather some lovely fibre and get to know my spindle a little better. I picked out the gorgeous hand pulled gradient roving I bought from Hilltop Cloud at Fibre East, yes, partly because it matched my spindle, (tell me I'm not the only one who does that?!) and got going! I am really enjoying spinning on this spindle, but am finding it a lot slower than the drop spindles which I am used to. This may be because I get a little fixated by winding the singles on really slowly and neatly as it just looks so pretty! I love your spindle. Turkish spindles are the ones that make me wish I could use a drop spindle because they are so fun looking. That single is looking very pretty too. I haven't tried Turkish or bottom whorl spindles yet, I feel like they would take some getting used to. So pretty, i am not surprised it has taken you a long time it is so neat and perfect! Thank you :) I'm finding this is definitely a spindle to use to enjoy the process rather than to produce lots of yarn quickly!